I am flabbergasted!! Tuesday's with Dorie never cease to amaze me. When I first bought Dorie's book almost two years ago there were some recipes that, just by name, I had decided not to try. To me there's something about a name. A name can explain everything. A name gives identity. A name relates an object to the brain. 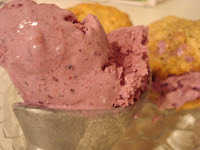 And when I read the name Blueberry Sour Cream Ice Cream I didn't know what to think. My first reaction was to the Sour Cream part. I am a huge sweet cream girl, I love my sweets. Sour in an ice cream (unless it's Sour Patch Kids) just doesn't seem like a sane thing to do. But, needless to say that's why I joined this group. I wanted to have a reason to try every recipe, whether I liked it or not. Baking gets kinda boring if you don't experiment. Besides, I've been pleasantly surprised before by my lovely little Apple Cheddar Scones. So, off I went to make this thing called "Ice Cream". In making the blueberry syrup I almost hit a snafu. The dang syrup was so good that I almost ate it all, but I made sure to leave plenty for my ice cream. It was a difficult task :) Then I dumped it into the blender gave it a whirl and added my sour cream base. I looked on in awe as my deep sea of indigo blue slowly transformed into a light airy lilac purple. As soon as everything was blended together I dunked my spoon in to get and early taste. I so wanted to say "Oh my gosh, this is absolutely disgusting." But, I couldn't bring myself to do it! I had to take another bite just to see if I was really tasting it right. Then I found my tongue craving yet another bite of the sweet blueberry taste with just a slight tang to it. I just couldn't believe that this was actually good and that I wanted to keep eating it! 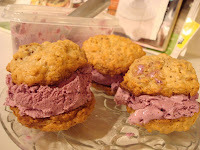 Things got even better once I turned my liquid heaven into a frozen blueberry goodness and slapped it between two homemade oatmeal pecan cookies! I actually think this dessert is one of the best representations of summer that I have ever had. And I am so happy that Dolores of Chronicles in Curiosity chose such an extraordinarily, original, mind blowing recipe! That looks SO GOOD in the oatmeal cookies! Nice work! 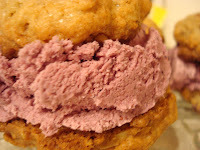 Seeing all the TWD ice cream sandwich creativity is making me want to bust out some cookies for my ice cream too! Great job! oh with the cookies....mouth watering!! I'm so glad the sour cream ended up working for you. To be honest I wasn't sure either... but I HAD to know. i felt exactly the same way - not at ALL sure this was going to be good. i never thought about the possibility that it might taste like cheesecake, which it kind of does. great idea with the cookies! I'd eat anything sandwiched between those cookies! Great job! I like how you put the ice cream with cookies, two of my favs!! Glad you liked it! Oatmeal pecan cookies? Wow - two of my favorite things. With ice cream. Fabulous. I am really jealous of you and everyone else who made the sandwiches! It sounds delicious. I still have some left, so I will have to give it a try. Forget the ice cream. Send the cookies! Looks great! Do you have a recipe for those cookies? YUM!!! isnt' it great how you think it's going to be weird but then ends up tasting SO GOOD?! How wonderful that your opinion turned around 180 on this! 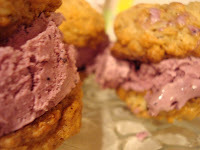 Your ice cream sandwiches look amazing. Love the sandwiches. Had some last night with a slice of chocolate cake - yum! Those sandwiches look great! I wanted to make them, too but ran out of time. Good for you for trying something new, too.